When it comes to purchasing a new stove top for the kitchen, a majority of buyers have a difficult time deciding between a gas stove and an electric stove. Which type of stove is better than the other? If you are currently in the process of choosing between a gas stove and electric stove, it is vital that you consider your personal needs as well as the needs of your family. Both types of stoves are readily available in the market; however, making the correct choice between these two options ultimately will depend on your personal needs and kitchen requirements. One of the initial things to consider when deciding between a gas stove and electric stove is the cost. In general, gas stoves tend to be slightly more expensive than electric stoves, but the ultimate price of the stove will primarily depend upon the brand and make of the appliance. Gas stoves tend to be a bit more pricey than electric stoves due to the additional installments that may be needed in the kitchen. For example, if your home does not currently have gas lines installed, you will need to invest in gas line installation and it can become quite costly. In addition to gas lines, you will also need to invest in a carbon monoxide measurement device if there is not yet one installed. Although a gas stove poses little risk of carbon monoxide exposure, it is a necessary safety measure that must be taken if you are considering investing in a gas stove. With all of these additions that comes with purchasing a gas stove, you may be better off by investing in an electric stove if you are concerned about cost. In addition to the price of the stove, you will probably want to consider the cleaning capabilities of each type of stove. Today, most modern stoves, regardless of whether they are gas or electric, include a self-cleaning mechanism. Although both types of stoves typically include self-cleaning devices, many individuals prefer gas stoves when it comes to overall cleanliness. This is due to the fact that gas stoves come equipped with sealed burners that are helpful in reducing messes while cooking. These sealed burners also make it much easier to scrub if food particles make their way onto the stove. Electric stoves, on the other hand, come equipped with coiled burners. 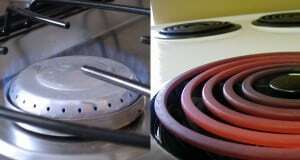 In order to clean an electric stove properly, these coiled burners will need to be removed. Throughout the years, many improvements have been made in technology, including kitchen appliances to make them operate more efficiently. When it comes to solving the age-old debate of which type of stove is better, it is of a matter of opinion and personal preference. Overall, when deciding between a gas stove or electric stove, it all comes down to cost and precision cooking. Regardless of what your ultimate choice may be, it is vital to perform research on each type yourself in order to make a well-educated decision. Contact C&W Appliance Service for all of your oven repair needs. We proudly serve the Dallas-Fort Worth-San Antonio area.